USAC .25 Midget "Generation Next"
(New Castle, DE) – While many were winding down their summer, the “Blackbird” dirt track, nestled at Airport Speedway, drew close to 200 cars for the national USAC .25 quartermidget event this weekend. With 14 total stops across the country, Blackbird served as Round 12 of the “Generation Next National Series and Round 4 of the Dirt Triple Crown Championship. Hannah Flood of Limerick, Pa (Honda Hvy 160 / Briggs Un-restricted Animal) and Connor Gross of Middleton, MA (Honda Lt 160 & Briggs Lt WF) picked up top honors in 2 classes for the weekend. Other winners receiving commemorative Gold medallions were Joe Toth of Newtown, Pa (Hvy Honda), Tori O'Neal of Everett, Pa (Sr Honda), Zac Vickers of Vineland, NJ (Briggs Hvy WF) and Christian Bruno of Deptford, NJ (Briggs Sr Animal). 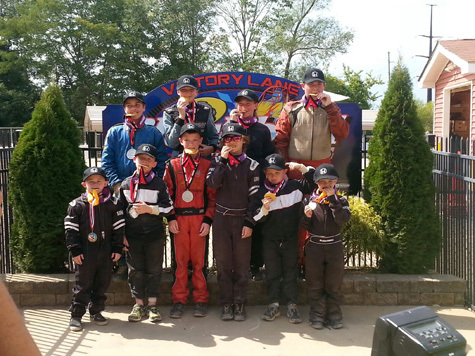 The Andrecs Family of Edgewater, MD took home 2 wins by brothers Alek (Jr Honda) and Braden (Briggs Jr Animal). Jonathon Morehouse of Harrington, DE (Red Rookie) and Mikey Tansy of Dryxel Hill, PA (Blue Rookie) took home participation medals. Dirt Triple Crown Championship’s will come down to the final stop on the 2014 Tour at the South Jersey Track in Atco, October 3- 5, 2014. Columbus Motor Speedway will host a “Wild Card” event to complete the pavement Championship Series, September 12-14, 2014. Drivers will be recognized at a formal banquet held in Indianapolis in conjunction with the PRI Show in December. Fore more information about USAC Racing, follow USAC Developmental on Facebook or checkout USACRacing.com/news.